This is an incredible book for all fans of Fringe. I'm one, and I'm thrilled by it. It's put together and presented in beautiful scrapbook style. Included are insets, removable items, posters. The book edges have navigation tabs coming out like those you case files you normally see on TV. Full marks for presentation. In terms of content, this book is packed with an amazing amount of information and pictures. The book covers in detail both the universes and the other timeline. You have Walter's history, stories about Peter's illness that leads to the crossing of the universe, Cortexiphan Trails, Massive Dynamic and their secret projects, Fringe division and all their agents and the cases they have worked on. That's just for the original universe. In the later sections of the book, it looks at all the differences between the universes and timelines. So you have Walter(nate) and all the Fringe doubles from the alternate universe. There's a lot to read. It's a good recap as the events are presented in more linear and hence clearer. You'll also get some insight because September's observations can be found in little blue notes all over the book. These are stuff you don't get from just watching the show, and there are many other nuggets of information. The pictures are great, and there are loads of them. There are the strange symbols from the opening credits, photos of the past Observers caught on camera, characters, news articles, graphics from the other universe, props, the time machine, gory pictures from cases, and more! It's a pretty comprehensive companion to the show. 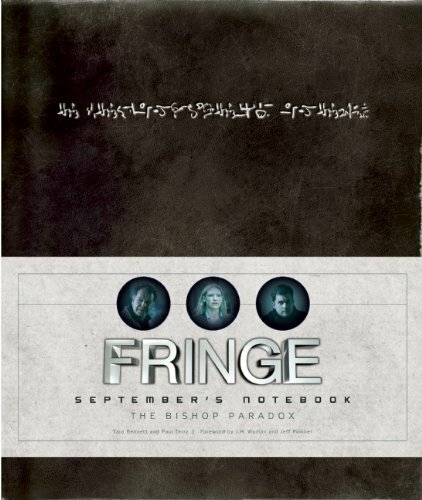 All Fringe fans should have this book. I'm glad you like the book. Great review, I love it! Please tell me something... What about the name of the fans that appear in the book. Is it true? @Mike What do you mean?